At TANFER HEALTH & AESTHETIC CENTER established in October 2016, we offer teeth aesthetics, aesthetics surgery, medical aesthetics, diet, regional slimming, personal consultancy and personal care. A fairy tale of charms is beginning. THE DOORS OF TANFER HEALTH & AESTHETIC CENTER opens to a world full of the epic heroes of the mythology. The reflection of the Hellenistic style on the reliefs of the ceiling and walls and on the decor of the sculptures and pillars are also adopted to the whole space where a fairy tale of charm begins as well as to the clothes of our personnel. Nothing is a secret anymore; you just have to ready the myths correctly... It is common belief that nothing remains a secret. Even the mythical stories of beauty did not remain as secrets. Neden bu sağlık profesyoneline güvenmeliyim? Founded in 1981 by Dr. Nihat Tanfer (DDSc), Tanfer Clinic started offering "Oral, Dental and Maxillofacial Surgery, Implant, Aesthetic, Teehth and Prosthesis Designing" services. Services at Tanfer Clinic expanded to include implant treatments since 1985 and Aesthetic Porcelain and Zirconium Teeth, Laminate Veneer and Bone Graft Applications since 1990. In 2012, Nihat Tanfer practiced “BOX TECNIQUE “ for the first time in Turkey and lead the way to change the lives of many people.” Today, applications at Tanfer Tanfer Health & Aesthetic Center are performed in various areas from mouth to teeth, from body to soul. Our aim is to provide the quickest and the highest quality services to our guests from inside and outside the country... At our center, our patients experience the happiness of finally having the teeth, the smile and the face that they've dreamed of in just a few hours with our latest technology methods and devices. While they have personal care, we also assist our guest to relax and find peace, to learn about the secrets to a healthy nutrition and to solve the mysteries of their souls through personal consultancy services. 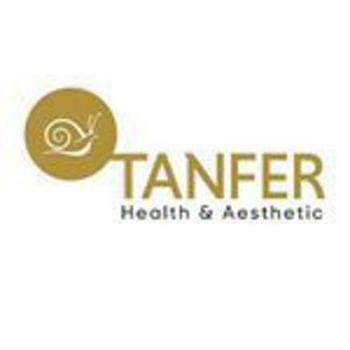 At TANFER HEALTH & AESTHETIC CENTER established in October 2016, we offer teeth aesthetics, aesthetics surgery, medical aesthetics, diet, regional slimming, personal consultancy and personal care. A fairy tale of charms is beginning. THE DOORS OF TANFER HEALTH & AESTHETIC CENTER opens to a world full of the epic heroes of the mythology. The reflection of the Hellenistic style on the reliefs of the ceiling and walls and on the decor of the sculptures and pillars are also adopted to the whole space where a fairy tale of charm begins as well as to the clothes of our personnel. Nothing is a secret anymore; you just have to ready the myths correctly... It is common belief that nothing remains a secret. Even the mythical stories of beauty did not remain as secrets. Today, let set off on a journey to a couple of myths living in the depths of history. The goddess of beauty Aphrodite whose secret to her appeal is rose oil as described in the Ancient Greek Culture represents everything that's beautiful in the universe. Brave Hera, whose stories billowing of olive oil have passed generations to generation until today, has been considered the second most beautiful goddess after Aphrodite. The secrets of Aphrodite and Hera whose solemnity shook the earth are an inspiration to us all... The olives rich in oleuropein have been used in the treatment of several diseases , delay aging and help rejuvenating the cells. Therefore, we have included olive branches to our concept as the secret to youth and as the symbols of peace and used in every detail of our center. This post has been written by Charms we offer for beauty... and viewed 3196 times.